i play guitar since 1988, i started to play because i love music, it's most important for my life! Scenes From a Memory by Dream Theater..i think it is perfect! Mister X hasn't uploaded any pics yet. This is a "relaxing" solo..emotional? Thank you so much for all the comments and props ! A neoclassic rock ..Thank you so much for all the comments and props!!! The Fall of the Gods pt.2 -and the dead will return to walk on the earth..thank you for all the comments and props! The Fall of the Gods Pt 1 i hope you like it! Thank you for all the comments and props! Tomaso Albinoni Adagio reinterpretation in pijama..7.15 a.m. LOL i hope you like it! J-rock a collab with Chris Reid ! Hi my friend here my collab with the great Chris!!! Thank you so much Chris for sharing with me your music!!! An impro just for fun! thank you fro all the comments and props my friend!!! InSane part 3 - the end..here the lst part , i hope you like it! thank you so much for all the comments and props! Insane - part 2 -Here the part 2 my friends! Thank you so much for all the comments and props!!! hi my friend..this is a musical joke inspired by a famous videogame.i hope you like it! Thank you so much for all the comments and props! Insane - original metal /prog metal song this is the part 1 of my new project..i hope you like it my friends| Thank you for all the comments and props!!! Ok my friend! It's time to start the new year..So..here my cover of "as i am" solo by Dream Theater..this is really really fast..i hope you like it!!! thank you for all the comments and props!!! Bonus track :-) Happy new year!!!! Christmas- ok this is my last post of the year..have a wonderful Christmas time my friends!!! Mister X - Guitar/ bass guitar/ acoustic guitar..etc.. The final part, i hope you like it! Thank you so much for all the comments and props!!! My new song , i hope you will like it! Thank you for all the comments and props! Dream Theater - A Better life-solo this is my cover..i hope you like it!!! Have a great sunday my friends! Thoughts part 2 , i hope you like it! have a great weekend my friend! Thank you for all the comments and props! this is an interlude from Illumination Theory by Dream Theater..one of my fav songs..i hope you like it!!! thank you so much for all the comments and props!!! A metal song, just for fun :-) thank you for all the comments and props!!! just a prog song..have a great sunday my friend! thank you for all the comments and for the props! Ok this is really hard to play for me! Thank you so much for the comments and props..and sorry for the mistakes! A classic from prog metal, i hope you like it! thank yous o much for all the comments and props!!! Surrender, trust & passion this song is dedicated to Jaruska Balis, be strong my friend!!! Illumination theory - paradoxe de la lumière noire - have a great September!!!! thank you for all the comments and props! Original Metal/prog metal song- Consciousness Pyramid- an original song from my cd , i hope you like it! thank you for all the comments and props!!! In the presence of the enemies,my DT cover..have a great August!!!! Time -Original Metal/ prog metal song from my new album Dramatic Events that you can find here:https://play.google.com/store/music/album/Giampiero_Dramatic_Events?id=Bp4fai2dflp5a4yo5v5lzcrfkfa or here: https://www.amazon.it/Dramatic-Events/dp/B07DYLLWL7 Thank you for all the comments and props!!! ok..i know..this is not blues..but i hope you like it :-D Thank you so much for all the comments and props my friends! Here my first signature guitar from Arda guitars,100% handmaded in Italy with my specs..i hope you like it!!! thank you so much for all the comments and props!!! After us ,final part . here the last part of this job inspired by a Stig song. i Hope you like it, thank you so much for all the comments and for the props! After us pt 2 ,here the second part of my new job, inspired by a Stig's song! Thank you so much for all the comments and for the props! After us part 1 - a new job inspired by a Stig's song..i hope you like it! thank you so much for all the comments and props! here i am again with a John Petrucci cover the song is "This is the life" from " a dramatic turn of events "cd.. thank you so much for all the comments and props..and sorry for the mistakes! I miss you- this is a guitar impro after a not great day..i hope you like it my friends..thank you so much for all the comments and props! ok..this is an idea for a new job..sorry for the poor video..but was the 7 a.m. LOL.. Thank you so much for all the comments and props! Here my solo cover of "a better life" from the Dream Theater cd "The Astonishing" i hope you like it! thank you for all the comments and props! Into the dark the end - ok..the last part..thank you so much for your patience! and thank you for all the comments and props!!! Into the dark part 3 here the 3 part..i hope you like it..Thank you so much for all the comments and props!!! Spettacolo di Forza - here my collab with the astonishibg Chris Reid! thank you so much for this song my friend!!!! This is my tributo to my favourite band (Dream Theater)..thank you so much for all the comments and the props..and happy Easter!!! the spirit carries on - ok this is a simple guitar solo..i hope you like it! Thank you so much for all the comments and props!!! into the dark part 2 Ok i know..today is the blues thursday, not a great day for a metal song..LOL Thank you so much for all the comments and props!!! Into the dark - here the part 1 of my new job..i hope you like it!!! thank you for all the comments and props!!! Mesa Boogie Mark V 25-Octavarium- the razor's edge - here my cover of the ending solo of Octavarium (Dream Theater). I relly love this song.. i hope you like it!!!! Hi my friend..finally i came back! here a new track, i hopr you like it! thank you so much for all the comments and the props! Something strange - ok this song i born when i was sick (38.2) and i think it's a really strange track..particulary the ending solo (if i can call him a solo..LoL ) thank you so much for all the comments and props!!! The shattered Fortress pt.3 -Sleep Paralysis- here another part of my job "The shattered fortress! I hope you like it Thanl you so much for all the comments and props!!! The Shattered Fortress pt.2 : Night Terrors - here the second part of my new job called the shattered fortress, i hope you like it! Thank you so much for all the comments and props! Here the ending solo of "The Count of Tuscany" hope you enjoy my friend! thank you for all the comments and props!!! The shattered fortress - here my new job, the part 1..thank you so much my friend!!!!! an impro, just for fun, with my old Hydra 2..thank you so much for all the comments and props! Our self destruction- here my new song.. i hope you like it! thank you so much for all the comments and props!!! Ok my friends..now it's time to start the new year with the original songs..this year my sound will be alittle to heavy..I have something with anger to tell..new stories..maybe new way....ok let's start with a song inspired by a John Petrucci riff..thank you so much for your time and your comments! music must be fun not some of serious..we have the gift to make music..so fun fun and fun!!! thank you so much my friends!!! here my rock impro..sorry for the mistakes, i am a bit cold..thank you so much for all your comments and props!!! under a glass crocodile moon- happy new year my friend!!!! have a wonderful 2018!!!! Astonishing- Dream theater cover; here my last post of 2017, have a fantastic days my friends! thank you so much for all the comments and props! act II grand finale ; someone asked me how i played this "grand finale";there are many overdubs, here a simple guitar line, the "raw" composition.. i hope you like it! thank you so much for all the comments and props! Act II ; here the new and last part of my opera..i hope you like it! thank you so much for all the comments and props!!! opera act I. hi my friend..here the act I of my opera prog metal..i hope you like it!!! thank you so much for all your comments and props!!! Phantom of the opera revisited.. happy halloween!!!! 7 days: day2 .here the second part..have a great weekend! 7 days-day one..here my new project..dark and sad (expecially the video..) but we have serious problems in our days..thank you so much for all the comments and props!!! the darkest of winter - thid is my heaviest and saddest composition; not only for the music, but for the mood, the two videos inside will explain it better than my words..thank you for all my friend! The Darkest of Wintere- Prologue- hi my friends, here the prologue of my new job (The Darkest of Winter) I hope that you like it! Thank you so much for all the comments and props!!! something strange .. hi my friends..here my new job..ok it is a very long song! sorry, i am not in my best mood..hopr you like it..thank you for all the comments and props! and sorry for the metal! our new world -here my cover of a Dream Theater song called "our new world" from the new cd " the astonishing"; i hope that you will like it! thank you for all the comments and props! Dream theater 2285 Entr'acte cover - here my new cover, i hope that you'll like it! thank you so much for all the comments and props! a better life solo - here a cover of John Petrucci solo from "A better life" by Dream Theater; thank you so much fo watching!!! The Dreamer - Giampiero Presilli - Ft Mauricio Garay Here my first collab with the astonishing Mauricio!!!! Thank you so much for your amazing job my friend!!! thank you for sharing yout fantastic talent with us!!!!!!! Variation on the imperial march -Metal ..a musical joke..i hope you like it! thank you for all the comments and for the props!!! here our new Dream theater cover "Anna Lee" from "falling into infinity" ; we hope that you like it! thank you for all the comments and props!!! happy birthday James!!! today is the birthday of James Noble, a great musician that we all know..Happy Birthday my friend! came back soon!!!!! sorry for the wrong word..What not wath ..here i am with the end of "life is strange"..thank you so much for listening and for all your commen... read morets and props!!! here our new cover of "the spirit carries on" by Dream Theater,vocal by Ly guitars and bass by Gy. Thank you for all your comments and props!!!! 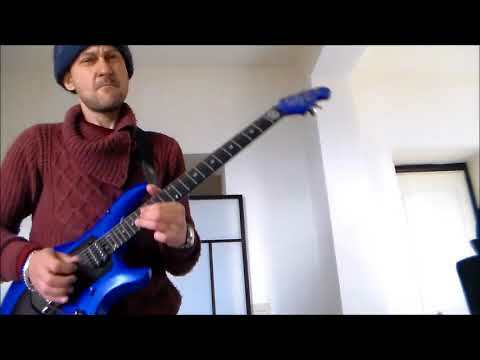 Dream theater - chosen solo here my cover :-) thank you for all the comments and props!!! made in japan - this was the last song that closed my shows in tokyo, for the endorsement..i hope you will like it! thank you so much for all the comments and props!!! and..arigato! ok..a new part of Life is strange..i hope that you will like it! thank you for all the comments and for the props!!!! Life is strange :surreal worlds ..here the 3d part..thank you for watching and for your comments my friends!